For many, asthma is caused by an allergic reaction to something. This is called allergic asthma is the most common. But a small number of people with asthma have “non-allergic asthma.” Lynn Johnson is part of this group. Lynn developed non-allergic asthma seven years ago, as an adult. It took quite some time to pinpoint what her triggers are. Lynn keeps a daily journal of her symptoms, the weather and what’s going on in her life. After analyzing three years of this data, she was able to identify a few patterns. Lynn found that her asthma is often triggered by weather changes, cold air, strong smells and stress. Sometimes, though, the trigger for a particular asthma attack remains a mystery. A big challenge for Lynn has been the lifestyle changes that her asthma required. For example, to avoid strong smells Lynn switched to using only scent-free products. “Literally anything that comes into my house must be scent-free,” she says. This includes cleaning products, deodorant, soaps, shampoo and more. This goes for the products that Lynn’s husband and two teenage sons use, too. Even her sons’ friends know not to wear any perfumes, colognes or other scented products when they come over to the Johnson’s house. Lynn’s problems with scents makes her afraid to go into other people’s homes. While Lynn has a few friends who go the extra mile to make their homes safe for her to visit, when they socialize, the Johnsons usually choose to be the hosts. Exercise has always been important to Lynn. She walks, jogs, rides stationary bikes and until three years ago was active in martial arts. Now there are times when she can exercise every day, and other times when she may have to go a month or two without being able to do much exercise at all. While these things are significant, Lynn’s biggest change has been at work. Once she understood that stress plays a major role in her asthma, she completely changed her job and career. Lynn has not been hospitalized again since she made the switch. From the medical standpoint, non-allergic asthma cannot be helped with allergy treatments. After all, it’s not caused by allergies. Medicine and trigger avoidance are the main treatment options. This means that keeping up with her medicines is very important for Lynn. In addition to her maintenance medicines, sometimes Lynn needs her quick-relief medicine every two to three hours around the clock. Other times she can go several weeks without it. To make things even more challenging, though, Lynn cannot use inhalers. Lynn also keeps a carbon filter mask in her purse. She’ll use it if she cannot avoid strong scents, such as someone’s perfume, and during flu season. Lynn has been very self-conscious about these things. She feels it’s embarrassing to have to use a nebulizer out in public. But AAFA’s online asthma support group has helped Lynn get past this. 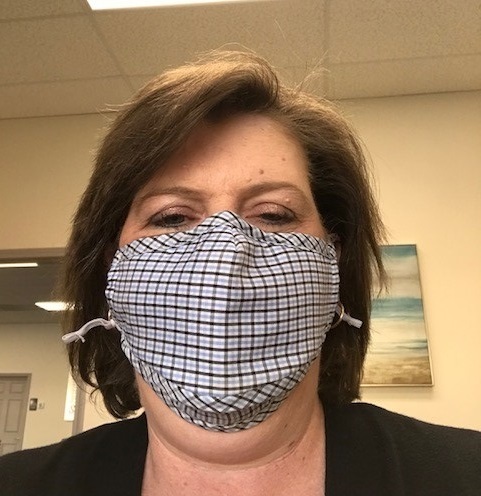 Lynn uses a mask to avoid asthma triggers, especially at work. Photo credit: Lynn Johnson. For Lynn, asthma is a year-round challenge. Luckily, her family has been very supportive and accommodating. Her family is also supportive of some of the changes they have had to make at home. For example, they must have a generator for the nebulizers. Vacations, outings and socializing all require a lot more planning and awareness. Lynn’s asthma affects the family’s budget, too. One of the issues facing those with asthma who live in the Birmingham area is poor air quality. Birmingham also has an extreme shortage of pulmonologists who will treat asthma patients. In her area, Lynn says that for people who have severe asthma, the allergists only want to manage the associated allergies. They refer patients to pulmonologists for management of the asthma. But most of the pulmonologists in the area want to focus on treating people with sleep disorders. For those that will treat asthma patients, there is a very long wait.